Postpartum Depression (PPD): Drowning in Love. This is a story of one young lady’s journey through postpartum depression. Thank you so much for sharing. This picture is from Lilly’s first bath; it was posted on July 9, 2014 when she was just two weeks old. I, quite literally, cannot look at this picture without crying. You see, I was drowning in this picture. I hadn’t washed my hair in days, and I couldn’t even change out of that nightgown for a few minutes to pretend like I had the motivation to do so. I’m smiling, but only because I knew somewhere in my mind that smiling would mask some of the redness that had set into my eyes from crying so much. I loved her so, so much, but all I could think about was how much better off she would be without me. About a week earlier, I had called my OB/GYN because I knew that what I was feeling could not be normal. She brushed me off, said that “everyone feels the baby blues,” that “it’ll get better with some sleep.” I left that conversation feeling worse than I already had, if that was possible. Maybe I was blowing it out of proportion. Maybe it was just the baby blues. Maybe I needed to pray just a little harder, trust just a little more. But the truth was that it wasn’t the baby blues, and while God can most definitely heal depression, He also gives doctors the wisdom to treat it, just like they treat any other ailment. It would take two weeks after that phone call, a full week after this picture was taken, for me to finally call again, to demand to be seen. The panic attacks were coming like rapid fire, and I could barely function. The only reason I called was that my husband insisted. I honestly think he was the one who made the actual phone call. I’m so thankful he did. If you’re familiar with Postpartum Depression (PPD), you know that there is a scale (the Edinburg Postnatal Depression Scale) that is used to determine the likelihood of PPD in patients. You answer questions based on your emotions, and the results are tallied into a number score. My score the day I went in was a 27/30; anything over a 10 is considered at risk for PPD. My doctor and I determined a course of treatment, and, slowly, I started to feel a little bit like myself again. I only told the people who needed to know about my diagnosis and treatment, mostly out of shame. There is such a stigma surrounding Christians and mental health, and it crippled my ability to share my story for a long time (honestly, it still does). I guess I share all of this today for a few reasons. First of all, I want you to know that you are not alone. You. Are. Not. Alone. 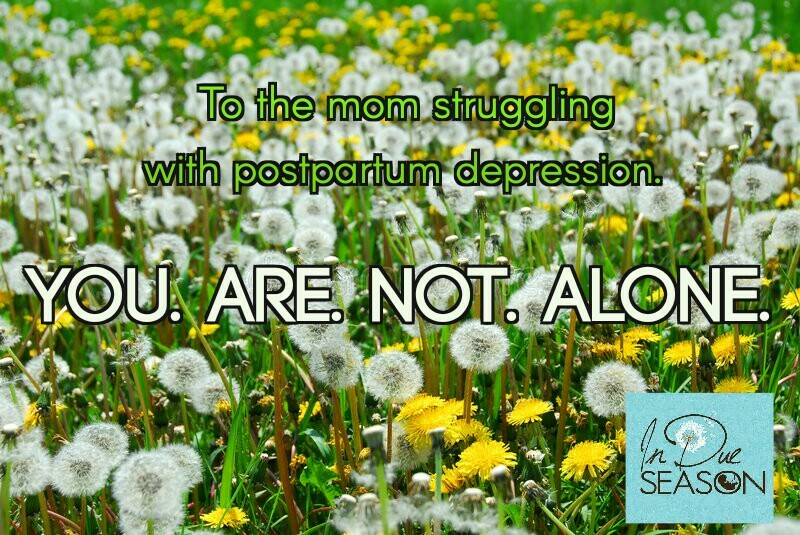 To the mama who is in that place, who is struggling, get help. If that looks like talking to someone, go talk to someone. If that looks like medication, go talk to your doctor and get on medication. If that looks like self-care, I will gladly watch your babies so you can do what you need to do. Just remember, you have someone in your corner. Secondly, find healthcare providers who not only advocate for you but who listen to you. If my OB would have listed to me the first time I brought this up to her, so much of the heartache that I experienced could have been averted. I experienced PPD with both Elliott and Arden, as well, but my stories with those pregnancies are vastly different than with Lilly because the people who were in charge of taking care of me actually listened. Thirdly, we need to end the stigma of mental health disorders in the church. Can Christ heal depression and anxiety? Absolutely. But supernatural healing is not the only way the Lord solves our problems, and it is foolish to not get professional help while seeking and casting your anxieties on Jesus. And, lastly, I am so thankful to serve a Savior who carries me in my struggle. Praise God that I did not have to walk through that alone because there’s no way I would have made it. Also, to the people who held me up during that time, thank you. I can’t say thank you enough. If you read all of that, thank you. It is not easy to share, and I appreciate your support.